When the mechanic finally deemed the cub airworthy after it’s extensive restoration the first thing I did was get my tailwheel endorsement. The second thing I did was take it to the drop zone. Now for those of you that are new here a drop zone is the term commonly used when referring to the local skydiving school or center. The dropzone I was jumping at in 1988 was located in Osceola Wisconsin and for those of us that jumped there it was paradise. The home of the St. Croix Valley Skydivers was a ramshackle building on 50 acres of rolling farmland with a 2500 foot grass/mud/rocks/mud/bumps/mud “runway” on it. Every Friday our little band of sky Gypsies would make our pilgrimage to the DZ, spend the weekend jumping, flying and generally having the time of our lives. We slept in tents, trailers, our cars or just drank until you passed out at the bonfire. Oh yeah, I forgot to mention the beer. There were vast quantities of beer consumed, but only after the last load had taken off, mostly. We also loved jumping out of different kinds of aircraft, airplanes, hot air balloons, helicopters and ultralights. If it could get us high enough we’d jump it. So when I showed up with the Cub naturally everyone wanted a ride. One way of course. Well the first person to get to jump the Cub was Geno, it was his plane after all. So he climbed into the front seat and the two of us went bouncing down the runway before finally staggering into the hot summer air. Oh, I forgot to tell you that the Cub had a very old and tired 65 horsepower engine that got one person off the ground just fine. But two grown men and a 25 pound parachute took a little more coaxing. After what seemed like an eternity the Cub finally reached the stratospheric altitude of 2500 feet and refused to climb any further. Good enough. Geno carefully extracted himself from the tiny cockpit, being careful not to punch a hole through the fabric side of the plane, and balanced on the left main tire while holding onto the wing strut. He looked like he was really enjoying riding on the outside of his plane until I yelled to him that he’d better go because with the extra drag of him out there we were losing precious altitude that we didn’t have to spare. He quickly let go and I flew circles around his parachute before landing. Now it was my turn. Just one problem. The only person who was checked out in the Cub was Geno. And Geno didn’t have a license. well, he had a solo license but meant he could only fly by himself or with an instructor, which I wasn’t. Hmmm. What to do? Wouldn’t want to break the law now would we? Not us. No surrey bob! That would be wrong. “But” I reasoned, “on takeoff and climbing to altitude I’ll be pilot in command, perfectly legal. And after I jump out you’ll be by yourself. Again perfectly legal.” Of course there was that grey area when I was on the outside of the plane and not manipulating the controls possibly making me a passenger but we decided that the regulations didn’t say anything about how and where you could hand over the controls of an aircraft. Anyway it was a long time ago and there’s no video so you can’t prove anything. And of course it’s always fun to take your buddy’s 4 year old son up in the Cub and duck down making it look like he’s alone. I stopped flying the Cub when it developed a crack in the wooden spar and neither Geno or I didn’t have the money to fix it. It sat neglected in a leaky T hanger for years slowly rotting away before being sold. 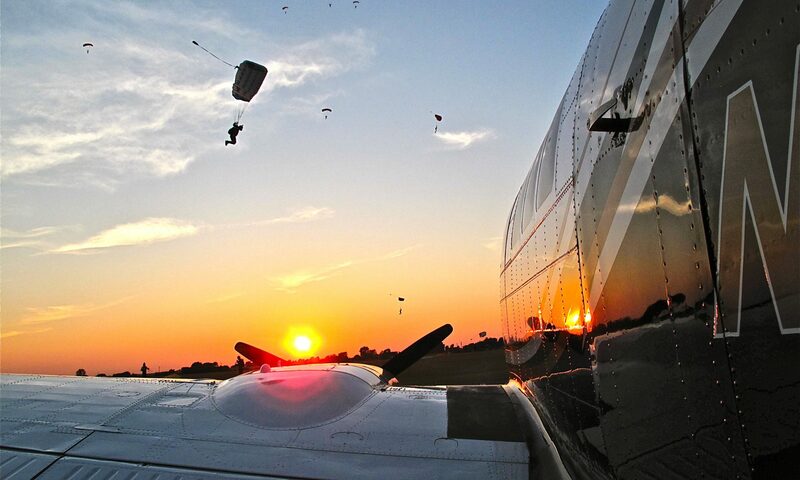 The drop zone was also sold to a non-skydiver after being the St. Croix Valley Skydivers home for over 30 years. Those days (and my youth) are long gone but the ghosts remain. Previous PostPrevious Brother, can you spare an hour?